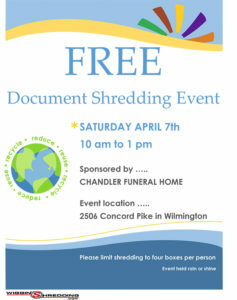 Chandler Funeral Home is sponsoring a free document shredding event on Saturday April 7 from 10 am to 1 pm. This event will be held in our parking lot at 2506 Concord Pike in Wilmington and is rain or shine. This entry was posted in News, Public Service Announcement. Bookmark the permalink.